Villa UJV 193, also known as Oceana, is a very private 2 bedroom villa located in the peaceful and quiet area of Vitet, St Barts. 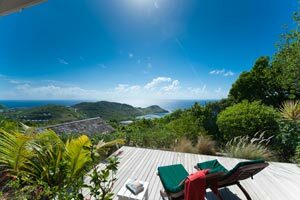 The villa faces east and features a panoramic view over the bay of Toiny, one of the best surf spots on St. Barts. Guests can admire the sunrise over the Atlantic ocean each morning and the moon rise at night, over the bay. Villa UJV 193 with its two identical bedrooms, is the perfect vacation spot. You will be five minutes away from the beach and the shops and fifteen minutes from the lovely town of Gustavia.